Okay, before I start the fangirling (and there WILL be fangirling), let me just ask you a favor. If you haven’t yet read Illuminae, and you like YA Sci-Fi, don’t read that synopsis above. If you already read it, try to forget it before you read the book. Because I went into Illuminae not knowing about most of that and I think I liked it even more because I didn’t see things coming. 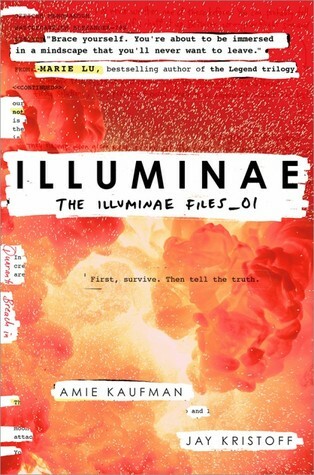 But regardless if you read the synopsis or didn’t, if you like YA Sci-Fi, YOU NEED TO READ ILLUMINAE. OMG YOU GUYS. ILLUMINAE WAS SO GOOD. I completely agree with Veronica Rossi’s blurb on the back cover of my copy of the book: it is totally the book I’ve been waiting for. THIS IS GOING TO BE SUCH A HARD REVIEW BECAUSE I DON’T WANT TO SPOIL ANYTHING. But this is MY KIND OF BOOK, you guys. It has all the spacey stuff I love and all the twists and turns my heart yearns for (THE TWISTS YOU GUYS, THE MOTHER-EFFING TWISTS). Yeah, if you thought you’d get a well-thought-out, eloquent review from me for this book, I’m sorry to disappoint you. INSTEAD YOU GET ALL THE CAPS AND ALL THE FLAILING AND ALL THE OMG’s. Should I add gifs? I THINK I SHALL. Characters mention glacieosaurs a couple of times. I REALLY HOPE THESE EXIST. Either way, 50,000 points. Blueprints of the spaceships. I LOVE MAPS AND BLUEPRINTS. 50,000 points. Basically, the premise of the book. I don’t want to say the phrase because I don’t want to spoil anyone but I’ll just say this: _______ IN SPAAAAACCCCCEEEE. 1,000,000,000 points. OMG I want to read it now. But almost 600 pages? YIKES. I looooved this book! It's huge but it read so quickly because of the formatting style. This book is an experience and even if you're not a fan of Sci-Fi, you must try it.